Remember when Xiaomi disrupted the whole budget smartphone market in India when it arrived? Well, Realme is now doing to same as the company has launched some great value for money phones in the budget and the lower mid-range segment like the Realme C1, Realme 1, Realme 2 Pro, etc. On November 28, the company will launch Realme U1 with the MediaTek Helio P70 processor that is expected to be priced between Rs 11-13K. One of the main complains from the Realme users is regarding the bootloader unlock. 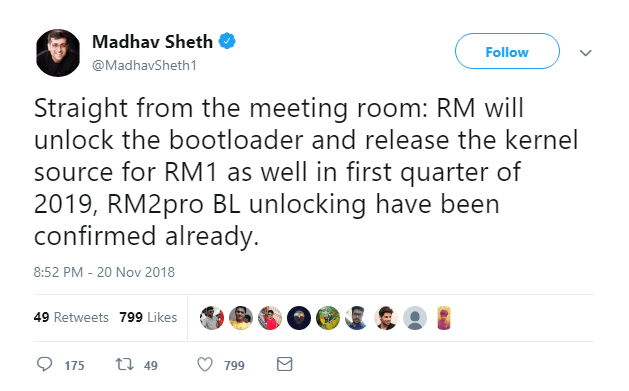 There is no official process for bootloader unlocking for the Realme devices but in the latest announcement from Realme’s CEO, Madhav Sheth, the bootloader unlock for Realme 1 and the Realme 2 Pro will be available in Q1 2019, along with the Kernel Source. The official bootloader unlock method will be available for Realme 2 Pro before January 15, 2019. This announcement was made on the #AskMadhav Episode 1 on the Realme’s official YouTube channel. Some other announcements include the release of the final version of Color OS 5.2 for Realme 2, Realme 2 Pro and Realme C1 before the end of December. Madhav also announced that the company is soon going to release some accessories like the Realme earphones. Realme is doing pretty good work as the company is listening to the users and making the necessary changes. One of the most requested changes from the users is the new UI. We hope Realme will introduce its new UI soon since Color OS is not that good.